Kennith Thomas and his son, Kristian, who was diagnosed with leukemia last month. 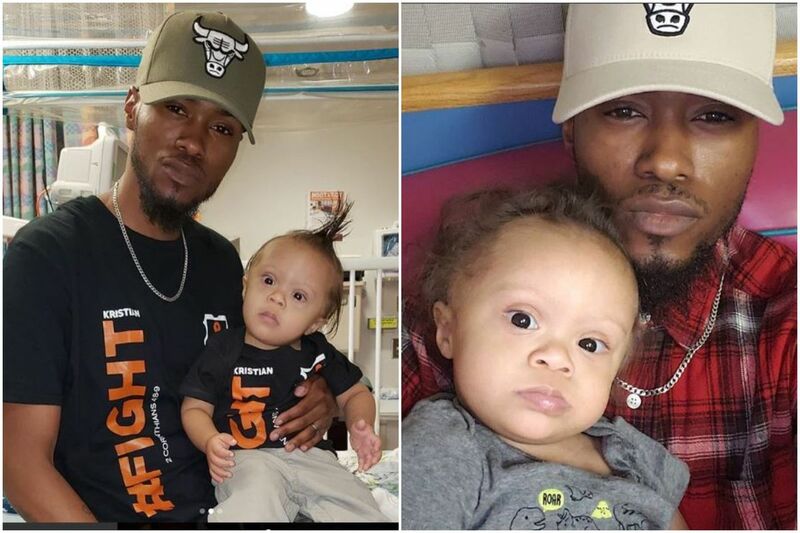 When dance instructor Kennith "Clutch" Thomas got word that his 15-month-old son, Kristian, could go home from Children's Hospital of Philadelphia for the first time since he was diagnosed with leukemia, the doting dad broke out into a happy dance next to his baby's crib. His son watched on in complete adoration. Thomas, 34, then posted a video of his cribside dance —a freestyle number to Ciara's "Level Up" — to his Instagram account, where he's been documenting his son's battle with leukemia. He hashtagged the video #levelupchallenge in honor of the song and in tribute to the dance studio he and his wife own in Pennsauken, the Level Brand. Thomas said he had no idea that the Level Up Challenge was actually a thing. But it is, and Thomas' post has become one of its most iconic videos. People across the country are posting videos of themselves attempting to perform the fast-paced dance moves seen in Ciara's "Level Up" music video, to varying degrees of success. They're also sharing ways in which they want to level up, or improve themselves. Before Thomas posted his video Saturday, he had about 5,000 Instagram followers. By Tuesday morning, he had more than 30,000 and his video had more than 2.2 million views. Ciara even reposted it to her Instagram account Sunday. "It's been really popping since then," he said. "When she reposted it that took it over the top." But what's put Thomas and his wife, Josilyne, over the top are the messages they've received — from as far away as South Africa to as close to home as other patients at CHOP. People are inspired by their son's story and by the uncanny positivity with which Thomas shares a positively difficult situation. "There are many people in CHOP … that said they watched our videos every day for inspiration," Thomas said. "Many people are telling us that our videos are inspiring them to fight. That's the message at the end of the day: To fight." Thomas and his wife, who live in Merchantville, have three other children, ages 14, 9 and 4. They opened their dance studio in September 2016. When Kristian was born last year with Down syndrome and a blood disorder, doctors told Thomas his son could develop leukemia at some point. But nothing could prepare the family for when Kristian received the diagnosis June 19. "In my mind as a father and as a believer and a leader of this family, I went into quarterback mode: What's the plan? How are we going to make this happen? How will we get him well?" Thomas said. "It hit our whole family. Our lives changed in a second." Thomas and his wife spent every night at the hospital with Kristian. Family and friends helped with their other three children. A dance camp they run at their studio that helps them financially through the summer months had to be canceled. While Kristian's medical care is covered by insurance, the expense of traveling back and forth to CHOP and losing out on income led Thomas to make shirts on the printing press in his dance studio that read #FightKristian, so he could try to sell them. He also began documenting Kristian's battle with positive posts on Instagram under the hashtag #FightKristian. Those efforts prompted people to send the family monetary donations. "I'm prideful, I'm not the kind of guy to just ask for money, but I had to make a bold move and reach out," he said. Before his video went viral, Thomas had raised about $6,500 in donations. Now, he has more than $10,500, something that gives him a small peace of mind for the coming months of Kristian's battle, which he plans to continue documenting. Thomas said his dream is that his son one day finds the purpose God has "laid upon him." "I think, in a way, he already is," Thomas said. "God is using him as an inspiration to so many people."